Below is the intraday outlook for JCY International. After the sharp retracement from the previous high of RM1.50 on Feb 8, finally JCY started to break out from its bottom consolidation since early this week. Based on the 15min chart, technicals is telling me it should retrace to 1.22-1.23 region before attempting to break the day high of 1.27 made in the morning session. However, on the line-up, buyers are way to many to allow a sell-down to 1.22, its more to 1.23-.24 region based on the line up. Hence, anywhere between 1.22-1.24 region is a good entry. 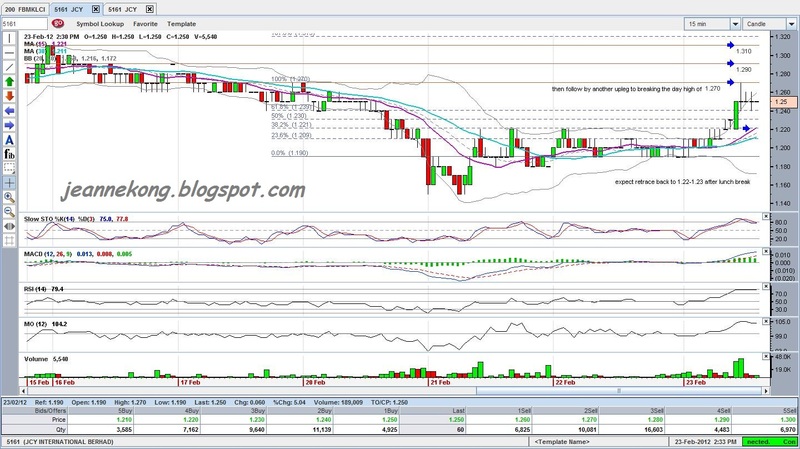 Immediate profit target will be the day high of 1.27, or higher, which should happen either today or by tomorrow. Once the 1.27 resistance is overcome, further upside should be to 1.29, then 1.31. However, note that a failure to break above 1.27 shall invite further selling to 1.09 (Jan 19), the starting point of the most recent rally streak.